Little Family Tree downloads data from your FamilySearch Family Tree to use in its games. It will use the people, places, and dates from your family tree as well as the photos that you have attached. Little Family Tree is a read-only FamilySearch application and does not make any attempts to update your FamilySearch Family Tree. 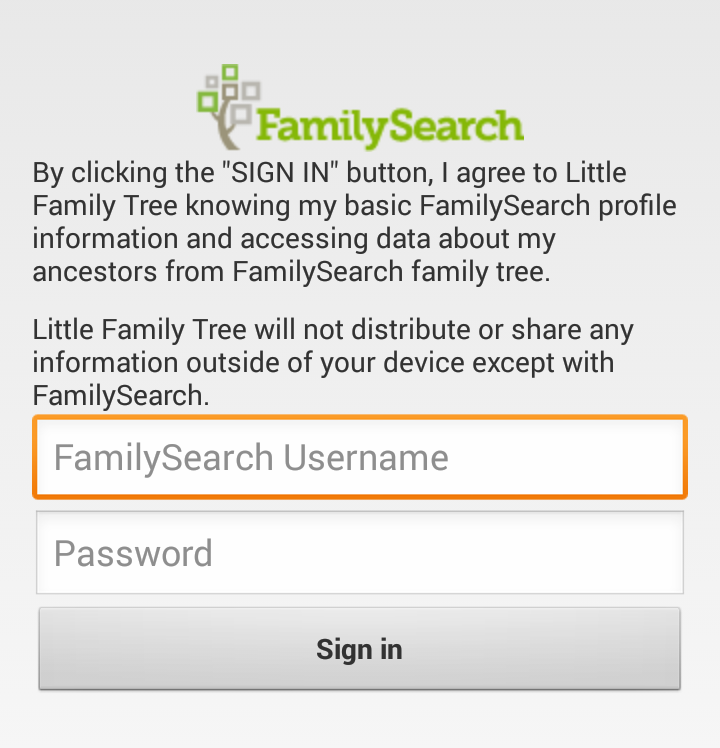 When you first start the application, Little Family Tree will ask you to enter your FamilySearch account credentials to login. Little Family Tree will remember your credentials so that you only have to login once from each device. They are encrypted and secure. After successfully logging in, Little Family Tree will begin downloading data and photos for you and your close relatives. Little Family Tree automatically synchronizes with your FamilySearch Family Tree in the background while your child plays. By default it will synchronize if you are on a WiFi connection and will check for updates of people you access in the game once every hour. Synchronization parameters can be controlled in the application settings. 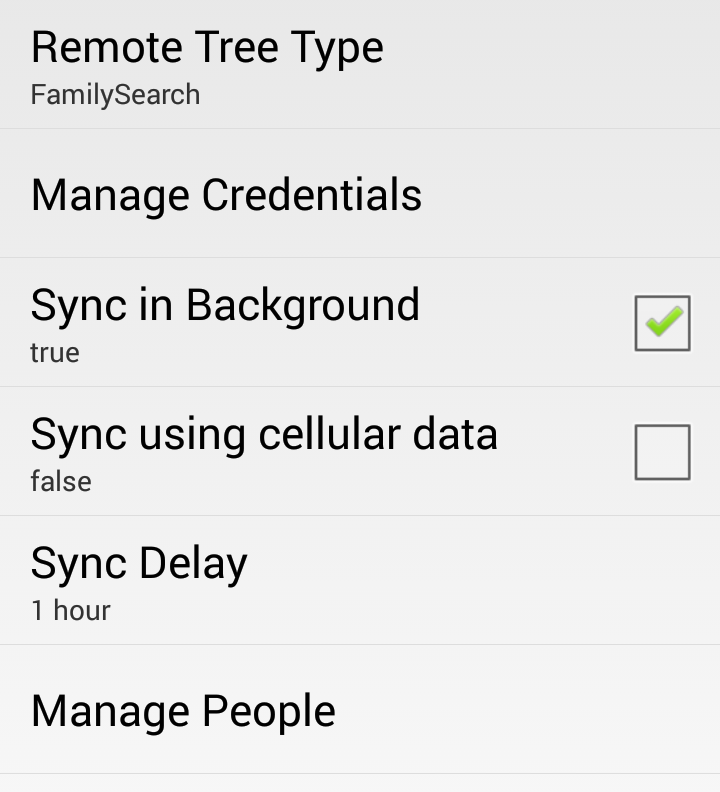 In the settings you can turn off background synchronization, change how often it checks for changes, and control whether or not to sync over your mobile data plan. From the settings, you can choose the "Manage People" option to see the people that Little Family Tree has synchronized. 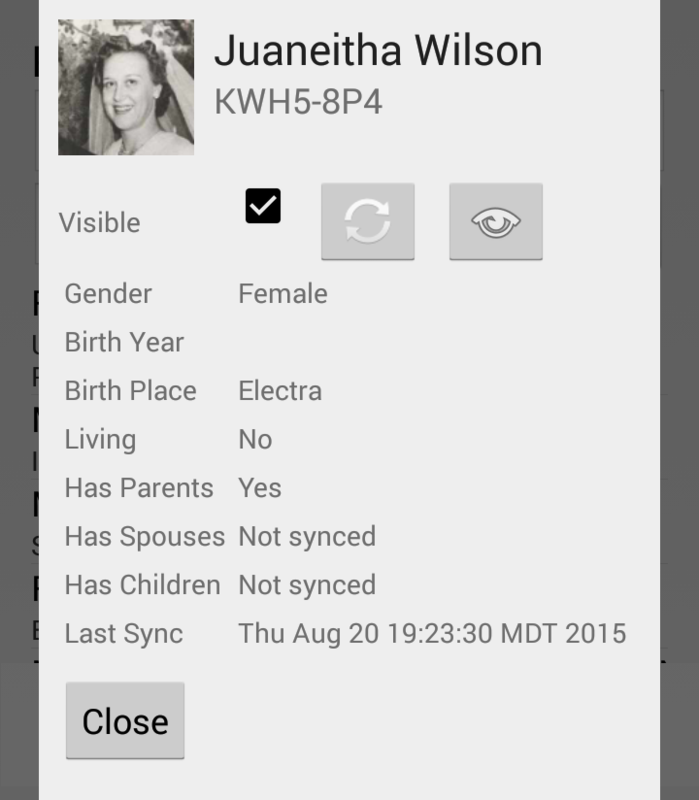 You may search by name or FamilySearch ID. 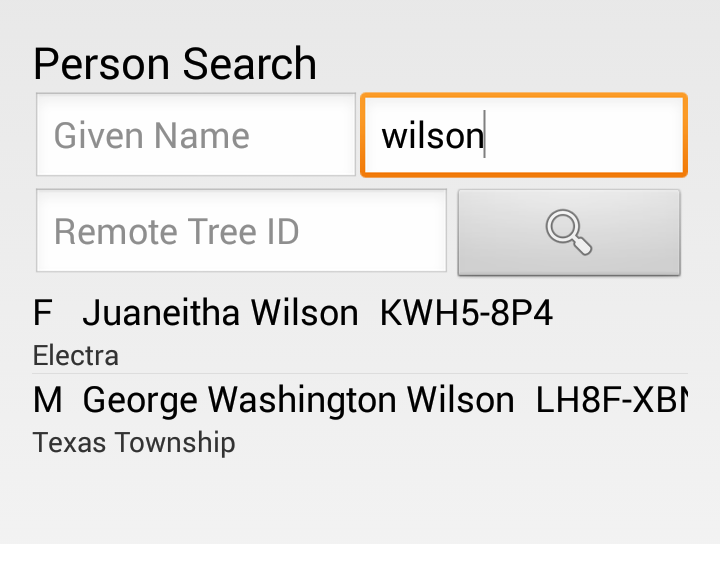 Click on a name in the list of results to see some of the key details of that person such as name, birth, and the last time he or she was synchronized with FamilySearch. From this screen you can also make a person visible or invisible. Setting a person to invisible, will hide them from the games in Little Family Tree but will not change or affect that person on the FamilySearch Family Tree. Tapping on the view button will open up that person's FamilySearch profile in your default web browser where you can make any changes. If you update your FamilySearch Family Tree and want to see the changes reflected immediately, then you can tap the synchronize button on the manage person screen. This will force Little Family Tree to download the latest information from FamilySearch without waiting for the normal synchronization time to pass.